To run a promotion, contest, giveaway, survey or other Website feature. Google Analytics – this service tracks Website usage and provides information such as referring websites and user actions on the Website. Google Analytics may capture your IP address, but no other personal information is captured by Google Analytics. In fact, this Website has activated the option to anonymize IP addresses, which prevents the collection of personal data from our Google Analytics tracking code. Users can completely block Google Analytics tracking by using Google’s opt-out browser add-on. Monster Insights – is a service that allows this Website to easily add, customize, and manage its Google Analytics website tracking services. This Website has activated the option to anonymize IP addresses. WPopt – is a service that provides web hosting for Crumb Top Baking. Information stored on this Website is stored on WPopt’s servers. Wordfence Security – is a security service that provides this Website with firewall and malware protection. It scans for hacked files and monitors the access of visitors to this Website in order to identify potential attacks from malicious IP addresses. Vault Press – is a service that provides daily backups of all information on this Website. Akismet – is a service this Website uses to check comments and contact form submissions against a global database of spam to help prevent this Website from publishing malicious content. Social Pug – is a service used to facilitate the social sharing of this Website’s blog posts. Readers may use the social sharing buttons to share particular blog posts to their social sharing networks. Once a reader clicks a social sharing button, his or her social network login is sent to the appropriate network to enable the share to happen. Readers should use their own discretion when providing any login information or sharing to any social network site. While Social Pug tracks the share count on this Website, it does not collect any personal information from readers. If you create a user profile on the Website or leave a comment, certain information may be publicly visible, such as name, avatar and website information. This Website may engage in sponsored campaigns with various influencer networks, brands, and agencies. All sponsored content is duly disclosed. From time to time, these sponsored campaigns utilize tracking pixels (aka web beacons), which may contain cookies to collect data regarding usage and audience. This information is collected by the sponsoring company to track the results of the campaign. No personally identifiable information collected by the Website is used in conjunction with these tracking pixels. Opt-out – You may opt-out of future email communications by following the unsubscribe links in our emails. You may also notify us at leanne@crumbtopbaking.com to be removed from our mailing list. Access – You may access the personal information we have about you by submitting a request to leanne@crumbtopbaking.com. Amend – You may contact us at leanne@crumbtopbaking.com to amend or update your personal information. The Website does not knowingly collect any personally identifiable information from children under the age of 16. If a parent or guardian believes that the Website has personally identifiable information of a child under the age of 16 in its database, please contact us immediately at leanne@crumbtopbaking.com and we will use our best efforts to promptly remove such information from our records. Crumb Top Baking is the personal blog of Leanne Combden. All blog posts are based on my personal opinion, and all content is of my own creation, unless I state otherwise. I am not a trained chef, baker, nutritionist, dietician or medical expert. Crumb Top Baking offers personal experiences and opinions and, as such, will not be held liable for any loss or damages arising from the use of this Website. From time to time, this Website may publish sponsored content. This will clearly be stated in the opening of the post. Crumb Top Baking will always be upfront regarding any brand affiliation, and readers can be assured that this Website will only affiliate itself with brands that it believes in and think would benefit the readers of Crumb Top Baking. Unauthorized use or reproduction of the text and/or photographs on Crumb Top Baking is prohibited, unless consent is provided. This means that the text of blog posts and recipes may not be copied and pasted and republished elsewhere without consent. Blog posts and recipes may be profiled on other websites by providing a link directly back to the recipe post on Crumb Top Baking. Photographs may be shared by providing credit to Crumb Top Baking at crumbtopbaking.com and by linking directly to the recipe post on Crumb Top Baking. 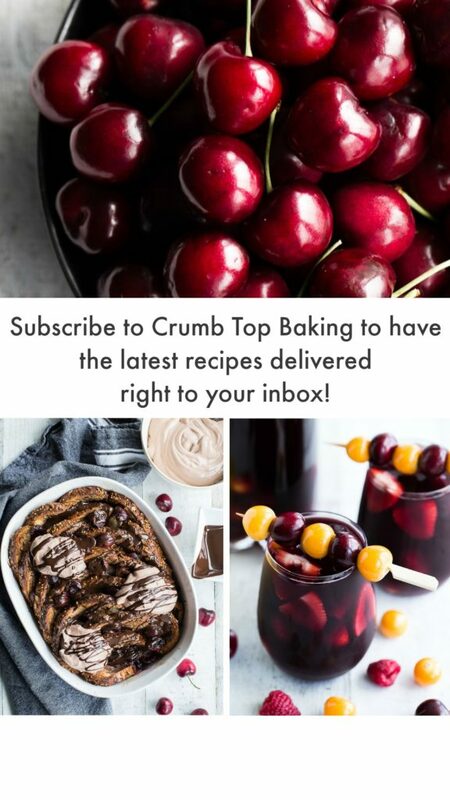 Crumb Top Baking appreciates comments and feedback from readers, but please note that this Website reserves the right to delete comments that are negative, inappropriate or identified as spam. Any comments posted on Crumb Top Baking may be used as promotional material on this Website or on Crumb Top Baking’s social media channels. Any comments readers leave on this Website are public and may be read, collected or used by anyone. Your name, website (if applicable) and date/time of comment will be displayed. Your email address will not be displayed. If you have a gravatar associated with your email address it may be displayed when you leave a comment on this Website. Readers accept these conditions when providing personal information and posting comments on this Website. From time to time, this Website may host giveaways. These events may be self-sponsored by this Website or may be sponsored by another individual, website or business. These giveaways will also require entrants to provide a certain level of personal information such as name, email address and location. This is captured in order to determine entrants’ eligibility to win the giveaway, and contact them in the event they are the winner. These giveaways may also be operated through third-party websites, such as Rafflecopter. These third-party sites will collect entrants’ personal information on behalf of this Website or the giveaway administrator. Readers are encouraged to read the privacy policies of these third-party websites before entering any giveaway. This Website may provide nutritional information for the recipes it shares by inputting the ingredients into an online calculator. The accuracy of this information is not guaranteed, and is only provided as a guide for Crumb Top Baking readers.